USS Nautilus was one of the V boats and a Narwhal class submarine. It was the third ship in the US Navy to be called this. 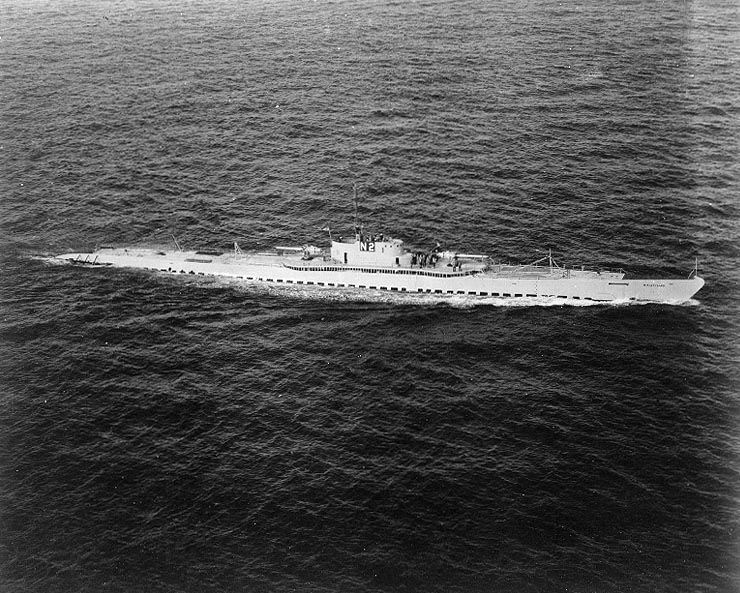 The submarine was originally named as the V-6 (SF-9). Subsequently on February 11th, 1925, the design of the submarine was modified and was assigned the hull classification symbol, SC-2. May 10th of 1927 saw the laying down of her keel by the Mare Island Naval Shipyard of Vallejo situated in California. Miss Joan Keesling went on to sponsor the launch of the ship on the 15th of March 1930. July 1st of 1930 saw the commissioning of the submarine with Lieutenant Commander Thomas J Doyle Jr. in command. Let us look at how this submarine was a significant asset of the US Navy in detail now. The eventual possibility of meeting Japan on the naval front in the frat western Pacific resulted in the designing of the V-4, V-5 and V-6 submarines. Apart from this reason, the Washington Naval treaty of 1922 mandated the need for strategic scouts or long-range submarine cruisers and also long-range minelayers. The minelayers were required for long endurance at sea as opposed to high speed. It could be said that the design of the V boats was influenced by the design of the German U cruisers, though the V boats were larger than any of the U cruisers. There was a raised gun platform was set up around the conning tower. Apart from this, deck stowage was provided under the platform and in the superstructure for spare torpedoes. The V boats were built with larger and more powerful diesel engines. However, these engines failed to deliver for they either didn’t deliver the promised power and resulted in several dangerous crankcase explosions. As a result of this, the engineering plants in these boats were replaced subsequently in 1941. V6 predominantly operated out of New London until the March of 1931, where it was used to conduct various submergence tests. She was subsequently renamed Nautilus on 19th February and was assigned the hull number SS-168 on July 1st. She was later shifted to Pearl Harbor. This was where she became Submarine Division 12’s flagship. She was later reassigned to Submarine Division 13, located at San Diego, California, in the year1935. She was employed there till 1938, after which she was redeployed to Pearl Harbor. She was used for regular training sessions and fleet exercises. She entered, in 1941, the Mare Island Naval Shipyard for the purpose of modernization. This was when she underwent the following additions/replacements – fitting of four Winton diesel engines, external torpedo tubes, air conditioning and radio equipment. Upon the completion of the modernization, she departed San Francisco on April 21st, 1942 and subsequently reached Pearl Harbor on April 28th. She was deployed for her first war patrol on May 24th, 1942, to help counter the attack expected from the Japanese fleet at Midway Island. On 4th June, while on patrol, she spotted some masts on the horizon of the northern boundary of the island at around 7:55 a.m. At the same time, the Japanese planes also spotted her and commenced strafing. To avoid it, she dived a 100 feet into the water and continued observing the planes. By 8:00 a.m., she was able to sight the formation of four enemy ships namely the cruiser Nagara, battleship Kirishima and two destroyers. She was spotted again by the planes in a matter of few minutes and the firing resumed. The two cruisers rounded her up for a kill and at a distance of about 1000 yards; nine depth charges were dropped. When the Japanese planes stopped the attack, she rose to periscope depth. She went on to fire two bow tubes at Kirishima, both of which didn’t meet the target. One of the bow tubes misfired while the other one simply missed to hit the battleship. At 8:30 a.m., one of the destroyers headed towards the submarine, which was diving 150 feet into the water. At 8:46, the submarine emerged, at periscope depth, by which time both the cruiser and the two destroyers were nowhere in sight. When the periscope was raised again at 9:00, an aircraft carrier came into sight. The submarine closed this time, with an aim to attack the aircraft. The aircraft carrier followed suit to attack and dropped six depth charges. By 9:55, the periscope emerged again with the cessation of the firing, by which time; the enemies were not in sight. At 12:53, a damaged aircraft carrier and her two aircrafts were spotted by the submarine. An hour after this, Nautilus moved forward to attack. Between 13:59 and 14:05, by which time most of the battle was over, she went on to launch 4 torpedoes at the carrier, while she was less than 3,000 yards away. One of the torpedoes did not succeed in running while two zoomed ahead in an erratic fashion. The fourth and final one was a dud, which did nothing but impact amidships and ended up breaking in half. The submarine soon reported that flames began to appear along the length of the ship, once the first hit was over. The skeleton crew present on board was reportedly moving to the side (who later confirmed that the torpedo failed to hit the ship), with the dud torpedo’s air flask, which ended up being a life preserver for the Japanese sailors. As another intense depth charge from the enemy commenced, the submarine dived 300 ft deep into the water. At 16:10, the submarine emerged again, by which time the carrier had been completely abandoned. She resumed her patrol later in the night, having survived 42 depth charges. Her artillery was replenished between June 7 and 9, after which she resumed patrol duties in the west. In the subsequent days, she was successful in damaging a destroyer, an oil tanker, and merchantman and sank a destroyer and sampan. Men of the 2nd Marine Raider Battalion lined up on the deck of the submarine USS NAUTILUS on 26 August 1942, as she docks in Pearl Harbor following the raid on Makin Island (17-18 August 1942). As part of a special mission in August, she was deployed to Hawaii. She reached Makin Atoll on 16th August, to stage a raid for diverting the Japanese off Solomon Islands. The next morning began with her sending the raiders in rubber boats to Butaritari Island, following which she started providing gunfire aid against the enemies. At 10:39, she was forced to dive into the water as an enemy plane emerged in the skies. Two aerial attacks followed suit, one at 11:30 and 12:55. At 17:00, the Marines began to withdraw their forces. They launched their boats at 19:00. In the absence of the aid from their outboards, several struggled to clear the breakers. Only a hundred men and seven boats returned that night. 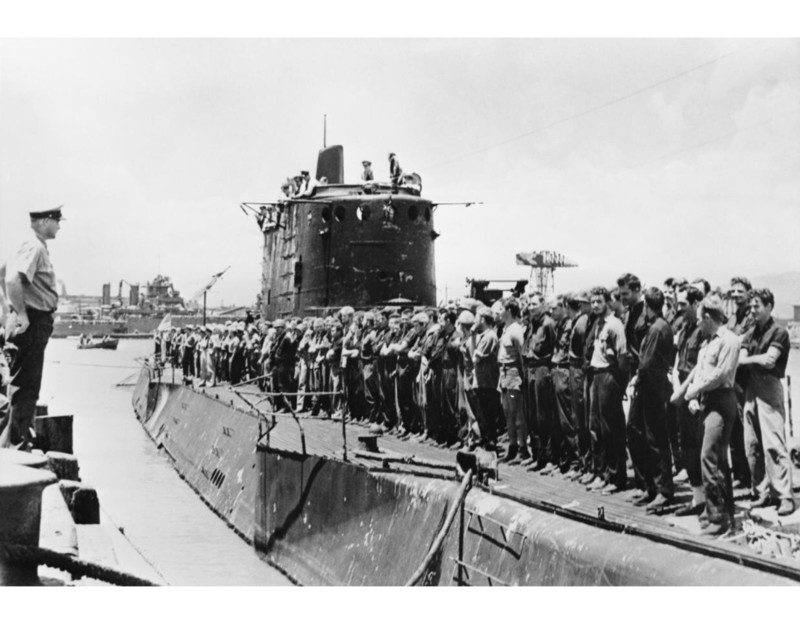 The remainder of the men and boats returned to the submarine, after discovering that there were no Japanese left to fight. However, nine of them were captured and executed by the Japanese. With the surviving marines on board, she left for Pearl Harbor and reached on August 25. She returned to the Japanese waters, as part of a submarine blockade from Kurile Island to the Nansei Shoto.​Despite the several adversities faced at the sea, such as torpedo firing, mechanical breakdown etc, she was successful in sinking three Japanese merchant ships. She also managed to destroy three sampans at the surface level. This patrol later turned out to be one of the most dangerous expeditions of her in the upcoming days. Oil and air leaks were soon discovered on her, which resulted in her leaving a trail for the Japanese. She moved on to a less dangerous area and continued her patrol on October 24, during which she sank Kenun Maru. Following this, she returned to Pearl Harbor, without facing any enemies on the way. She stopped at Midway Island in between, where temporary repairs were performed. As part of her fourth patrol in Solomon Islands, between December 13th, 1942 and February 4th, 1943, she was successful in rescuing 3 children and 26 adults from Toep Harbor. She also sank a cargo ship and damaged a destroyer, a freighter and a tanker. After debarking her passengers at Brisbane, she set sail to Pearl Harbor once again. Five days after her arrival, she sailed north to Alaska, where she began instructing the 7th Infantry Division Provisional Scout Battalion on amphibious landings. Upon embarking 109 scouts, she moved to Attu, where she landed them before the planned assault. She spent most of the summer at Mare Island and departed to Pearl Harbor on 16th September 1943, for her 6th war patrol. This time, her focus was on Kuma, Tarawa, Abemama, Butaritari and Makin. This turned out to be a highly productive mission for the pictures of the coastlines and chart corrections brought back by the submarine was instrumental in planning the invasion of Tarawa. On 18th November, she returned to Tarawa, for the purpose of obtaining information on surf conditions and weather, landing hazards and the implications of the latest bombardments. On 19th November, at 21:59, she was mistaken for an enemy submarine by the USS Ringgold, which fired at her. This firing resulted in a 5-inch shell attacking her conning tower, which in turn damaged her main induction valve. She dived into the water at once and the damage control team immediately set to work. The preliminary repairs were completed within 2 hours, which helped her continue her journey to land 78 scouts on Abemama. The midnight of November 20 saw her laying 3000 yards off an island in the Abemama Atoll, with the purpose of discharging her passengers. All of her passengers were safely ashore the following afternoon. On November 22nd, she was instrumental in providing firing support to bring the enemy garrison out of their hiding. This resulted in the death of 14 enemies while the remaining killed themselves. Abemama was completely secured even before the main assault team could arrive. By this time, preparations were going on to turn this place into an air base, keeping the Marshall Islands campaign. On December 4th, she returned to Pearl Harbor to prepare for her 8th war patrol, which was to be conducted north of Palau and west of the Mariana Islands. The patrol was conducted between January 27th, 1944 and March 21st, 1944, during which time she managed to sink one cargo ship and damage 3 other cargo vessels. On 26th April, she set sail for Brisbane, from where she would depart to conduct a series of special guerilla missions in Philippines. As part of her 9th patrol, she transported oil, dry stores and ammunition to Mindanao. She carried a similar cargo to Negros Island and transported evacuees and set sail for Darwin. As part of her 11th patrol, she landed 12 tons of stores on North Pandan Island and dropped by more supplies at Mindanao. She focused on Philippines during 12th, 13th and 14th patrols, where she would land personnel and supplies at different points on Luzon and Mindanao. She was also successful in transporting evacuees from these points to Australia. She landed at Luisan Shoal, on September 25th, as part of these three patrols. To lighten her load, her mail, evacuees, cargo and captured documents were sent ashore. Any secret materials on board were burnt immediately and reserve fuel tanks were blown dry. Six-inch ammunition present on board was jettisoned. She was able to get off the reef easily within three and a half hours, once her main ballast tanks were blown off. She managed to clear the area by dawn. On October 31st 1944, during her 13th patrol, the Nautilus destroyed USS Darter, which had stuck on a reef, and could not be recovered. A number of attempts to torpedo the wreck had only failed because the torpedoes kept exploding on the reef instead of the wreck. Nautilus’s guns, on the other hand, completely destroyed the Japanese boat. Nautilus completed her last patrol on January 30th 1945. She moved from Australia to Philadelphia, Pennsylvania for inactivation. She arrived at Philadelphia on May 25th 1945. She was struck out of the Naval Vessel Register on July 25th and was sold to the North American Smelting Company on November 18th as scrap. This entry was posted in Warship by MSW. Bookmark the permalink.